CSISS is represented by a board of directors and staff from a variety of non-profit organizations and government agencies all working to stop the spread of invasives in our region. Natalie Stafl is the Acting Ecologist Lead at Glacier and Revelstoke National Parks for Parks Canada. She joined the Board in September 2018 as a representative from Parks Canada, however she has been involved with CSISS previously as it’s first Coordinator in 2013 and as a Board alternate. Kim Kaiser joined CSISS at the beginning of the 2018 season after working with the BC Mussel Defense program in 2017 and training with the ISCBC job Creation program in 2016. She completed a Bachelors of Science in Biology at The University of Victoria in 2014. She began work with CSISS as the Education officer in 2018 and is continuing with a new role Coordinating the CSISS outreach program in conjunction with Aquatics Coordinator Sue Davies. For the 2018 season we had an Aquatic and Outreach Assistant and a Field Assistant with support from Canada Summer Jobs. Heather Wilson was our Aquatic and Outreach Assistant and Sam Legebokow was our Field Assistant. Thanks for all your wonderful work this summer! Robyn Hooper is the Executive Director of the Columbia Shuswap Invasive Species Society. 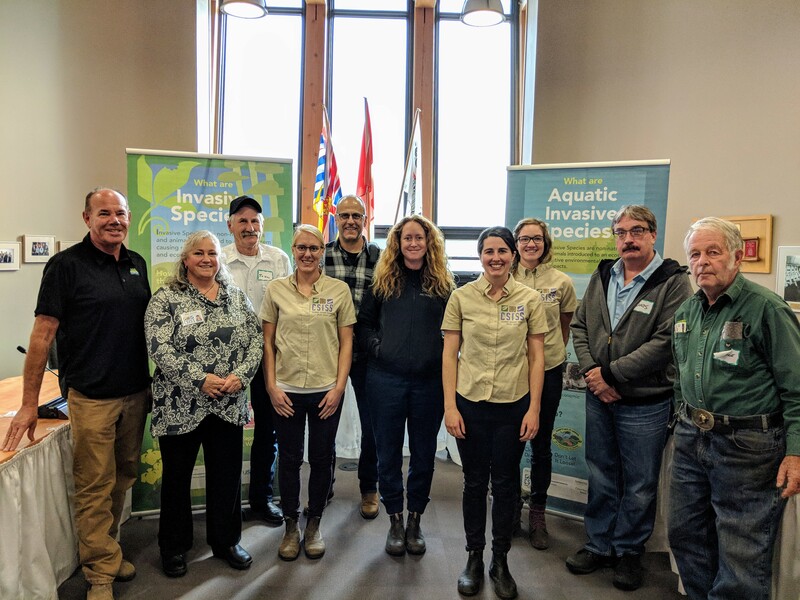 CSISS is a non-for-profit that works with a variety of land managers and stakeholders on invasive species management within the Columbia Shuswap region. Robyn has been working with CSISS since April 2014 on invasive species outreach programs, field mapping and monitoring programs, and partnership engagement. Robyn has a Dual Masters degree (Masters of Science, SLU and Masters of Forestry, UBC) and has worked throughout BC and Sweden engaging local communities and key stakeholders in climate change adaptation issues. Laura has a degree in Biology from the University of Northern British Columbia, as well as a course in Environmental Monitoring. She has spent time working for Golder Associates as a Wildlife Biologist, assisting with the Woodland Caribou project in Revelstoke and working locally for the BC Wildfire Management Branch. In her spare time, Laura can be found on local mountain trails. Laura Gaster joined the CSISS Team as Program Assistant in April 2015 and currently manages the CSISS Field Operations Program. Chris Gill has 20 years of experience in applied conservation biology with a primary focus on protecting rare and endangered species. In 2010 Chris founded Coastal Conservation, an organization whose mission is to restore island ecosystems in Canada and internationally that have been impacted by invasive vertebrate species. Chris resides in the Shuswap and joined the CSISS Board in September 2017. John Braisher is a rancher based south of Golden BC and brings extensive knowledge of agriculture and land management to the Board since joining in the fall of 2016. Diane works with the Ministry of Forests, Lands and Natural Resource Operations as a Natural Resource Technician based locally out of Revelstoke. She recently joined the CSISS Board of Directors in September 2015. Hamish is the Environmental Services Coordinator for the Columbia Shuswap Regional District. He currently manages the Eurasian Water Milfoil Control Program, three mosquito control programs, the CSRD Noxious Weed Control Program and eight groundwater monitoring functions. He is also responsible for inspections and maintenance of CSRD dikes, and partners with the Ministry of Environment to conduct water quality monitoring in addition to his participation in the Shuswap Lake Integrated Planning Process (SLIPP). Hamish has worked with the Okanagan Basin Water Board, Ministry of Environment, Taranaki Catchment Commission in a variety of positions related to water quality, protection, management and invasive species. He has extensive underwater experience logging more than 4000 hours on SCUBA as well as receiving underwater photography awards while working in New Zealand. The winter months often find Hamish sliding on fluffy powder snow with friends and family. Hamish is the current Director of CSISS. Chris Cochran is the Manager of Operations for the Town of Golden where he has been the last four years. Prior to moving to Golden, he served in the Office of Public Works for the City of Castlegar for 7 years. Chris has an educational background in Civil Engineering and currently serves on the Board of Directors of the Parks Canada Advisory Development Board as well as the board of BC Water Supply Association. Chris enjoys camping, exploring the back roads with his quad and building models. Chris is currently serving as Vice-Chair of CSISS. Adam is based in Revelstoke as a Senior Environmental Coordinator with BC Hydro and has served on the CSISS Board since the fall of 2013. 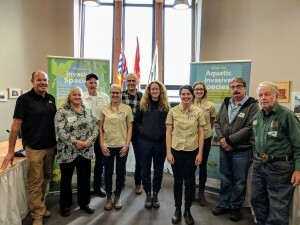 Bruce is a long-time resident of the Shuswap and has been actively involved with Invasive Plant Management as a retired spray contractor for the regional district. Darren is the Operations Managers with the city of Revelstoke and joined the Board in 2013 to represent municipal interests.